A birthday design complete with music! 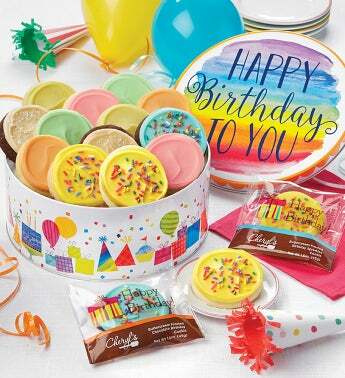 Every time you lift the lid our birthday tin plays "Happy Birthday to You"! Each tin is filled with delicious assortment of buttercream frosted cookies including chocolate and confetti birthday cake, orange citrus, strawberry sugar, salty caramel, key lime white chip, lemon burst and our birthday cake decorated cookies. Perfect for everyone’s birthday celebration. OU D. 16 cookies.